Forty years ago, scientists warned that a hole in the layer of ozone surrounding the earth could have serious effects on human health and the environment. This problem is being solved thanks to a global agreement to stop the use of ozone-depleting chemicals that damage the ozone layer. But now scientists are concerned that the substances used to replace these ozone-depleting chemicals are acting to trap heat inside the earth, exacerbating the greenhouse effect. Can policymakers protect the ozone layer while also helping prevent climate change? What is the ozone layer and how was it damaged? The ozone layer sits in the stratosphere between 15 km and 30 km above the earth. It absorbs most of the sun's ultraviolet radiation (UV-B), limiting the amount of this radiation that reaches the surface of the Earth. Because this radiation causes skin cancer and cataracts, the ozone layer plays an important role in protecting human health. It also prevents radiation damage to plants, animals, and materials. In the 1970s, scientists noticed that the ozone layer was thinning. 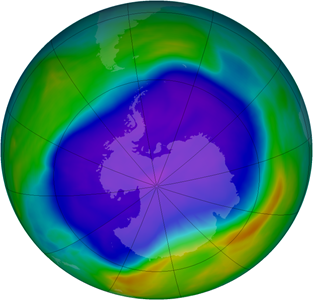 Researchers found evidence that linked the depletion of the ozone layer to the presence of chlorofluorocarbons (CFCs) and other halogen-source gases in the stratosphere. Ozone-depleting substances (ODS) are synthetic chemicals, which were used around the world in a wide range of industrial and consumer applications. The main uses of these substances were in refrigeration and air conditioning equipment and in fire extinguishers. Other important uses included aerosol propellants, solvents and blowing agents for insulation foams. Ozone depletion (blue colours) in the South hemisphere in 2006. To halt the depletion of the ozone layer, countries around the world agreed to stop using ozone-depleting substances. This agreement was formalised in the Vienna Convention for the Protection of the Ozone Layer in 1985 and the Montreal Protocol on Substances that Deplete the Ozone Layer in 1987. In 2009, the Vienna Convention and the Montreal Protocol became the first treaties in the history of the United Nations to achieve universal ratification. Substances covered by the protocol are referred to as 'controlled substances'. The main substances include chlorofluorocarbons (CFCs), hydrochlorofluorocarbons (HCFCs), halons, carbon tetrachloride, methyl chloroform and methyl bromide. The damage to the ozone layer caused by each of these substances is expressed as their ozone depletion potential (ODP). 2007, governments made an additional commitment, agreeing to freeze production of HCFCs in developing countries by 2013 and to bring forward the final phase-out date of these chemicals to 2030. These international agreements helped to greatly reduce the worldwide use of ozone-depleting substances in Europe and around the World (Figure 1). Scientific monitoring shows signs that the ozone layer is starting to recover. Full recovery is not expected to occur before the middle of the 21st century. The reduction in ozone-depleting substances has also had a beneficial side-effect. Ozone-depleting substances are also very potent greenhouse gases, contributing to the phenomenon as other substances widely known to have a greenhouse effect like carbon dioxide (CO2), methane (CH4) and nitrous oxide (N2O). Therefore, by reducing emissions of ozone-depleting substances, the Montreal Protocol has protected both the ozone layer and the climate at the same time. The magnitude of this benefit is substantial. The reduction in ODS emissions expected as a result of compliance with the Montreal Protocol has been estimated globally at 10-12 giga-tonnes of CO2-equivalent between 1985 and 2010 (Velders et al. 2007). In contrast, the reduction target of greenhouse gas emissions under the Kyoto Protocol (assuming full compliance by all developed countries) is estimated at 1-2 giga-tonnes of CO2-equivalent on average per year between 2008 and 2012, compared to base-year emissions. The phasing out of climate-changing ODS under the Montreal Protocol has therefore avoided greenhouse gas emissions by an amount 5-6 times larger than the target of the Kyoto Protocol for 2008-2012. The reduction of ODS emissions is not a uniformly positive story. In fact it has indirectly led to new problems. Fluorinated gases (F-gases) have been introduced as substitutes for ODS in many sectors such as refrigeration and air conditioning applications. F-gases include hydrofluorocarbons (HFCs), perfluorocarbons (PFCs) and sulphur hexafluoride (SF6). These gases do not deplete the ozone layer, but they are greenhouse gases. This means that these new gases also contribute to climate change. And to make matters worse, these F-gases often have a far larger impact on the climate than 'traditional' greenhouse gases such as carbon dioxide (CO2). For example, some F-gases have a greenhouse effect that is up to 23 000 times more powerful than the same amount of carbon dioxide. Fortunately, the emissions of F-gases are far smaller than those of CO2, but the use of F-gases and their presence in the atmosphere have increased since the 1990s. As a result, the significant contribution of the Montreal Protocol to fighting climate change is in danger of being wiped out by the growing importance of F-gas emissions. F-gas emissions are monitored under the United Nations Framework Convention on Climate Change (UNFCCC) and its Kyoto Protocol, but not currently addressed by the Montreal Protocol. Fluorinated gases presently account for about 2% of global greenhouse gas emissions. Several countries have started to take measures on F-gases, led by the European Union (EU) which has committed to reducing use of HFCs, the most important F-gases, by 80% of today's levels by 2030. There are two approaches to reducing F-gas emissions. The first approach is to avoid the use of F-gases completely by using gases or technologies that are less damaging to the climate. The second approach is to reduce the use of F-gases in products and equipment. The EU first set out specific policies to reduce F-gas emissions in 2006 with the so-called 2006 F-gas Regulation, and with a directive limiting F-gases used in air conditioners in cars, the so-called MAC Directive. In the absence of this legislation, F-gas emissions were projected to increase (Figure 2, orange line). A gradual “phase-down” of HFCs from 2015 onwards accomplished by step wise limiting the quantities that can be placed on the EU market. A number of accompanying bans. These new measures will lead to savings of 70 Mt CO2 eq per year, or two-thirds of 2013`s emissions, by 2030. Expected total cumulative avoided emissions are estimated to be 1.5 Gt CO2 by 2030 and 5 Gt CO2 by 2050. Figure 2: Projected evolution of F-gas emissions from all emission sources in the EU-27 in 1995-2050 in the scenario “without measures” (i.e. without EU F-gas policies), the scenario “with measures” (i.e. initial EU F-gas policy) and additional measures (i.e. the new F-gas policy). Because F-gases contribute to climate change, businesses are now looking to replace them with other substances. Alternatives that do not damage the ozone layer or contribute to climate change have become available over recent years in a variety of applications such as refrigeration, air conditioning, foam blowing and aerosols. Many of these alternatives lead also to higher energy efficiency which is important as the indirect emissions from energy use during the lifespan of a product are often considerably higher than direct emissions of F-gases. HFCs account for 98% of F-gas emissions, and their use continues to increase even though environmentally-friendly alternatives to HFCs exist. Measures that further limit the use and emissions of HFCs are therefore needed. Within the EU, ensuring a full implementation of the new F-gas Regulation (and in particular the phasing down of HFCs that it envisages) is critically important. And even though most ODS are being phased out, the Montreal Protocol still allows some quantities of ODS to be produced and used for certain niche applications (e.g. feedstock use). Cost-effective alternatives in these niche applications should be developed. In addition, large quantities of ODS are still contained in old equipment (refrigeration systems and air conditioners) and buildings (foams) and will be released in to the atmosphere if not properly reclaimed and destroyed. Measures enabling the safe recovery of remaining ODS are therefore also essential. For references, please go to https://www.eea.europa.eu/themes/climate/ozone-depleting-substances-and-climate-change/protecting-the-ozone-layer-while or scan the QR code.